With legislators beginning to complain about the EPA chief’s corruption, there were rumors that President Donald Trump would replace him. But then came the announcement that Trump called Pruitt and told him he had the EPA administrator’s back. WASHINGTON — Let’s consider the strange case of Scott Pruitt. 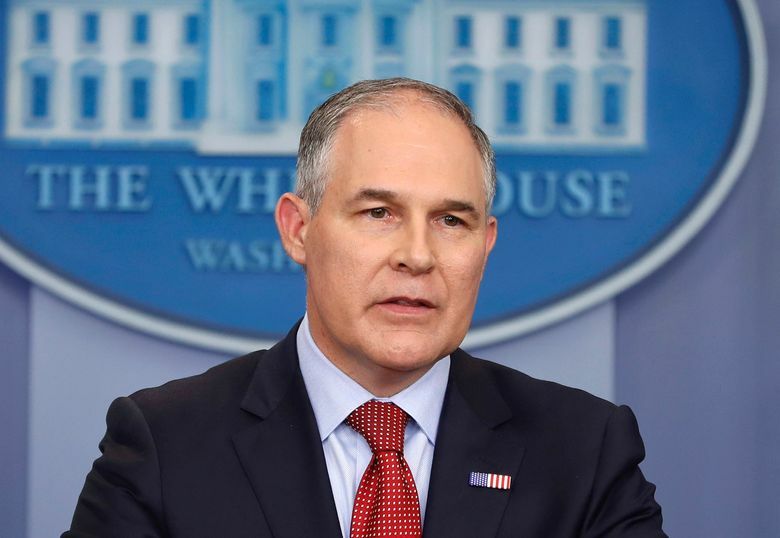 A former attorney general of Oklahoma, Pruitt came to public consciousness by suing the Environmental Protection Agency 14 times to block clean air and water rules on behalf of industry people who then gave him campaign funds. So perhaps we should not be surprised that President Donald Trump made him head of the EPA, in charge of the nation’s environment, drinking water, Superfund sites and air pollution. We should have known that Pruitt is a climate change denier who has made it his mission to dump more carbon dioxide into the air, not less. This has been proven repeatedly to be a cause of flooding coastal flooding, desertification of agricultural lands — including in the U.S., melting glaciers, disappearance of species at ever more rapid rates and the pending poverty of millions more people, according to 99 percent of the world’s climate scientists. We should have known that Pruitt not only is not draining the swamp; he rose from the swamp. Case one: Pruitt skirted the White House to give a 30-year-old, political aide at EPA a raise from $107,435 to $164,200 and a 26-year-old aide a raise from $86,460 to $114,590 after a year on the job. Three years ago she worked at a hotel outside of Nashville. Meanwhile Pruitt got rid of many career staffers at EPA. Case two. Pruitt last year rented a luxury condo for $50 a night, paying only when he slept there, from the wife of an energy lobbyist for whom he did favors as head of EPA. Republican and Democratic legislators alike say this was an illegal sweetheart deal. Case three. He took $160,000 worth of taxpayer-paid first-class, military and private charter flights before reluctantly agreeing he’d look into coach class. Case four. He had a $43,000 private “secure” phone booth built in his office. One does wonder who he’s calling. Case five. He told regional EPA administrators they and their scientists would no longer be making decisions about key provisions of the Clean Water Act — he alone would decide if streams, ponds and wetlands would be preserved or developed. Part of this is to make certain no environmental considerations stand in the way of building Trump’s wall on the border with Mexico, if that ever happens. Environmentalists are worried because water storage, flood prevention, wildlife habitat and drinking water all depend on such decisions. Last year Pruitt announced an effort to reduced legally protected waters of the United States by two-thirds. It is not clear whether court proceedings will stop his move. With legislators beginning to complain about Pruitt and corruption, there were rumors that Trump would replace him. But then came the announcement that Trump called Pruitt and told him he had the EPA administrator’s back. Next day, White House Chief of Staff John Kelly also reassured Pruitt. This support for Pruitt came after the Veterans Affairs chief was fired, allegedly for taking his wife to Europe on a business trip and accepting Wimbledon tickets although he repaid the government and after the head of the Department of Health and Human Services was fired for taking military flights. Different strokes for different folks. Sure enough, Pruitt next announced a rollback of Obama-era fuel efficiency standards designed to reduce greenhouse gas emissions and make cars much more fuel efficient. Part of Trump’s determination to get rid of the bulk of Obama-era environmental standards, this move will go to court, but that could take years. Pruitt’s ambitions do not stop at gutting hard-won environmental rules. He privately has suggested he should replace Attorney General Jeff Sessions and then fire special counsel Robert Mueller, ending Mueller’s probe of Russia’s interference in U.S. elections. Eventually, Pruitt would like Trump’s backing to be president. He should learn that sooner or later everyone associated with Trump ends up badly bruised, if not ruined.